Stacyville’s Tom Pitzen is not only quite talented, he is quite generous. 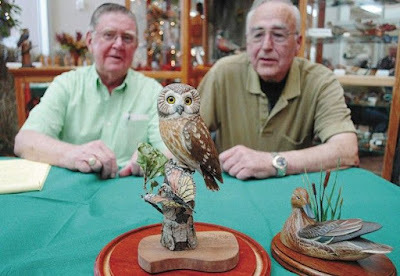 The nationally and world-reknowned wood carver and artist, who has won international awards for his work over the past four decades, recently carved a special owl worth several thousand dollars which will be raffled off to benefit the Mitchell County Food Bank. The saw-whet owl that will be raffled is carved out of jelutong, an imported wood from Malaysia, and similar works have sold for tens of thousands of dollars. Pitzen’s creation will be on display at the museum in Osage, as well as on a rotating schedule all the banks in Mitchell County before the winner is announced on Dec. 30. As for Chisholm, he is hoping the Food Bank will sell $4,000 to $5,000 worth of tickets, which are now available at the museum and at all Mitchell County Banks, as well as from Chisholm himself. Price for the raffle tickets are $5 each or six for $25. All proceeds will go to feed needy families in Mitchell County. As for those who are not familiar with Pitzen’s world-class wildlife carvings, several of them are currently on display at the museum in Osage, along with newspaper clippings, books, programs and other memorabilia that commemerate is talent for carving wildlife, especially birds. One of his works was featured on the front page of the Des Moines Register Sunday Picture magazine in 1979, just months after he won best of show in the U.S National Decoy Contest. That same year, Pitzen took entered the International Wood-carvers Congress in Davenport and won first place. He then went on to win a first place at the World Championships in Woodcarving in Salisbury, MD. Pitzen said it has been nearly 30 years since he was actively showing his wildlife carvings at national shows. But even today, viewers of his work look on with much admiration and amazement at his realistic works of wildlife. He has spent countless hours, days, weeks, months and even years on his carvings, making them virtually lifelike in shape, texture and colors. Pitzen eventually moved up to model airplanes, bookends and cartoon caricatures in his carving adventure, taking first place in a school competition making a set of pistols with a coping saw. He used wood from crates he acquired at the grocery store down the street. Tom’s father, Sy Pitzen, had a shop in Stacyville, but instead of woodworking, his real passion was taxidermy. By the late 1970s, Pitzen making my own wood decoys and bird carvings and entered the International Wood-carvers Congress in Davenport. “I won first place there, then went on to win a first place at the World Championships in Woodcarving in Salisbury, MD and also the International Congress,” said Pitzen. “One of my prize decoys was chosen as part of a still life grouping in the 1983 Ducks Unlimited painting. “I was always surprised every time I would win an award, because from what I would see at shows and what they would show in the carving catalogs done by other wildlife carvers looked really great to me,” said Pitzen. For his wildlife carvings, Pitzen sais he mainly uses a basic set of six carving tools. His favorite wood is jelutong, which is hard, yet easy to carve on. One of Pitzen’s favorite works, and also quite popular, is a pheasant family which includes a rooster, hen and their chicks. It won second place in a national competition. Along with the owl carving for the Mitchell County Food Bank, Pitzen has also thrown in a decoy duck he carved for a second place winner.